Background: The use of nutritional supplementation of the brewer's wort can be an interesting option to increase cell viability and yeast fermentability. 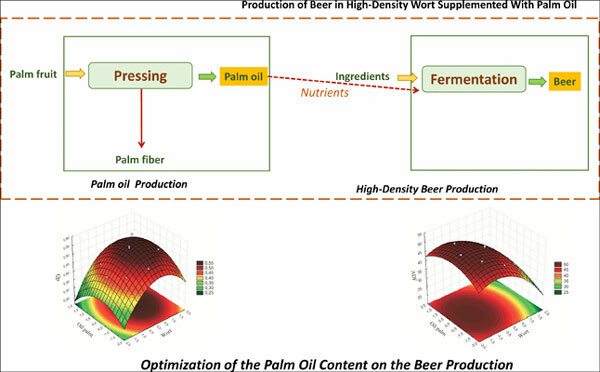 Objective: This study aims to evaluate the effects of the variables wort concentration and nutritional supplementation with palm oil in the production of beer in high-density wort. Methods: The process effects were evaluated through the central composite rotational design of type 22 associated with the Response Surface Methodology (RSM). The fermentations were carried out using the commercial Saccharomyces cerevisiae yeast, lager type, at 15°C. Results: The mathematical models and RSM obtained were an efficienct strategy to determine the optimum fermentation point for the ethanol volumetric productivity (wort concentration of 20.90 °P and palm oil content of 0.19 % v/v) and for the apparent degree of fermentation (wort concentration of 16.90 °P and palm oil content of 0.22% v/v). There was a good correlation between the experimental values observed and predicted by the model, indicating that the fit of the model was satisfactory and it can be inferred that the increase of the wort concentration and the nutritional supplementation with the palm oil reached an ethanol volumetric productivity of 0.55 g/L.h and an apparent degree of fermentation of 50.20 %. Conclusion: Therefore, it can be concluded that our study demonstrates that nutritional supplementation with palm oil is an alternative and promising option for the breweries to increase productivity. There are recent patents also suggesting the advantages of using alternative nutritional supplements in beverage production. Beer, palm oil, high gravity, supplementation, modeling, productivity.